Should Americans have a “right to be forgotten”? In decisions with far-reaching implications on both sides of the Atlantic, European courts and regulators have ruled that Google and other search engines must delete links to Europeans' unwanted personal information from the Web, reinforcing a “right to be forgotten” that has a long legal tradition on the continent. 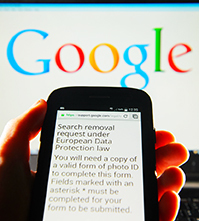 A French regulator's order applying that doctrine to the Google.com search page used by Americans is widely seen as conflicting with the U.S. Constitution's guarantee of free expression. Even so, some privacy advocates say Americans should have a right to erase some information from the Web, such as embarrassing photos or postings that could damage their reputation or prevent them from getting a job. So far, federal and state laws allow only certain kinds of data, such as bankruptcy records, to be expunged online after a certain period of time. But polls suggest Americans want more control over other kinds of personal information online.